Another historical moment, moving the world towards no more orca in captivity, was reached on 3 May 2017, when France introduced their Cetacean Decree. In a nutshell it bans the breeding of cetaceans in France and the keeping of any individuals, other than those already there. 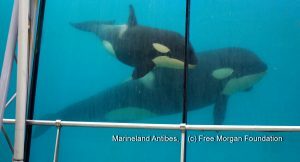 This means, that there will be no more orca in France after these die or are moved out to a sanctuary. Currently there are four orca in captivity in France, all held in Marineland Antibes and all were born in captivity (3 males, 1 female). This will leave Loro Parque in Spain, where Morgan is held, as the only place in Europe which holds orca. Of course, SeaWorld claims ownership of those orca , but Loro Parque have publicly stated that, against SeaWorlds own breeding-ban, Loro Parque want to keep breeding the orca. The French Decree can be read in its original French form, via the French Government’s website. The Free Morgan Foundation has also had help from supporters to translate the French Decree into English and Dutch. However, please be aware, these are not official translations and are provided here to help us understand the process the French Government is going through. There is talk that the captivity industry will challenge the Decree – so we encourage you to write to the French Government, French Politicians and put it onto French Social Media, that you support the Decree. Additionally, if you only speak English, please inform others about it – the more people who know about it and support it, at an international level, the harder it will be for the industry to challenge it. Share the Decree on Social Media. Talk about it on Social Media and get the message across that Decrees such as this are welcome by those who care about cetaceans. Of note is that we have been informed that the Decree will be ratified into Law on the 3rd of November, and at that point we will endeavour to have an official translation done of the final wording. Of course, if you live in Spain, then we highly recommend that you to spread the word about the French Decree to the Spanish Government and strongly encourage them to implement a cetacean ban themselves. 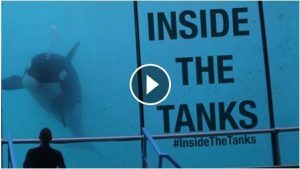 If you are interested in learning more about some of the issues at Marineland Antibes, Dr Ingrid Visser, our co-founder, was interviewed for this 34 minute mini-documentary. If you aren’t able to watch it on Youtube (its free), but would like to read about it, Matt Spiegl one of the FMF Board Members, has written a great article for the Huffington Post.